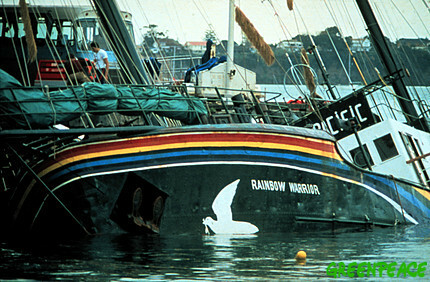 Greenpeace vessel Rainbow Warrior is bombed and sunk in Auckland, New Zealand Harbor by French DGSE agents. The sinking of the Rainbow Warrior, codenamed Operation Satanic, was an operation by the “action” branch of the French foreign intelligence services, the Direction Générale de la Sécurité Extérieure (DGSE), carried out on July 10, 1985. It aimed to sink the flagship of the Greenpeace fleet, to prevent her from interfering in a nuclear test in Moruroa. Fernando Pereira, a photographer, drowned on the sinking ship. Two French agents were arrested by the New Zealand Police on passport fraud and immigration charges. They were charged with arson, conspiracy to commit arson, willful damage, and murder. As part of a plea bargain, they pleaded guilty to manslaughter and were sentenced to ten years, of which they served just over two. The scandal resulted in the resignation of the French Defence Minister Charles Hernu, and the subject remained controversial. It was twenty years afterwards that the personal responsibility of French President François Mitterrand was admitted. Operation Satanic was a public relations disaster. New Zealand was an ally of France. France initially denied involvement and joined in condemnation of a terrorist act. After the bombing, a murder inquiry was started by the New Zealand Police. Most of the agents escaped New Zealand but two, Captain Dominique Prieur and Commander Alain Mafart – posing as married couple ‘Sophie and Alain Turenge’ – were captured due to a Neighbourhood Watch group. Both pleaded guilty to manslaughter and were sentenced to 10 years imprisonment on November 22, 1985. France threatened an economic embargo of New Zealand’s exports to the European Economic Community if the pair were not released. Such an action would have crippled the New Zealand economy, which was dependent on agricultural exports to Britain. In June 1986, in a political deal with the Prime Minister of New Zealand David Lange and presided over by the United Nations Secretary-General, Javier Pérez de Cuéllar, France agreed to pay NZ$13 million (USD$6.5 million) to New Zealand and apologise, in return for which Alain Mafart and Dominique Prieur would be detained at the French military base on Hao atoll for three years. However, the two spies had both returned to France by May 1988, after less than two years on the atoll. Mafart returned to Paris on December 14, 1987 for medical treatment, and was apparently freed after treatment. He continued in the French army and was promoted to colonel in 1993. Prieur returned to France on May 6, 1988 because she was pregnant, her husband having been allowed to join her on the atoll. She, too, was freed and later promoted. As this was in violation of the agreement, the French were required to pay further reparations. Three other agents, Chief Petty Officer Roland Verge, Petty Officer Bartelo and Petty Officer Gérard Andries, who sailed to New Zealand on the yacht Ouvéa, were captured by Australian police on Norfolk Island, but released as Australian law did not allow them to be held until the results of forensic tests came back. Expecting the tests would show they had transported the bombs to New Zealand, the crew was picked up by the French submarine Rubis and sank the Ouvéa. They were never punished. A sixth agent, Louis-Pierre Dillais who was commander of the operation was never captured and never faced charges, despite acknowledging his involvement in an interview with New Zealand State broadcaster TVNZ in 2005. As evidence gathered, a commission of enquiry headed by François Tricot cleared the French government of any involvement, claiming that the arrested agents, who had not yet pleaded guilty, had merely been spying on Greenpeace. When The Times and Le Monde claimed that President Mitterrand had approved the bombing, Defence Minister Charles Hernu resigned and the head of the DGSE, Admiral Pierre Lacoste, was fired. Days later, Prime Minister Laurent Fabius admitted the bombing had been a French plot.